Kids may frequently have digestive issues caused by an imbalance of good versus bad bacteria in their digestive tract. This is where a large percentage of the immune system resides. Therefore probiotics can be your child’s best friend when their system is being challenged. 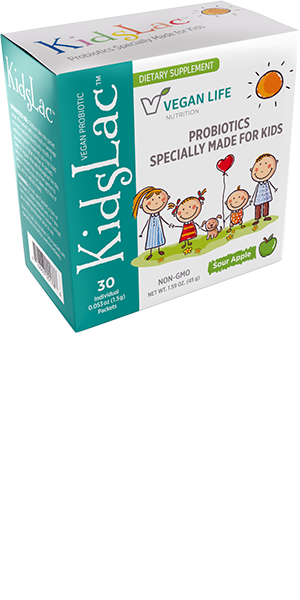 Five unique strains of friendly bacteria specifically selected and blended to benefit kids digestive systems. Contains the DDS-1 strain of Lactobacillus acidophilus which is one of the most studied probiotics on the market. Sour apple flavor that kids love ensures that you will not have a problem getting them to take it. Easy-to-use stick pack format allows you to pour right into your mouth or pour over cool foods such as apple sauce or yogurt. Fun box design looks friendly and inviting to kids. 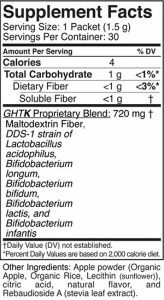 DDS-1 strain of Lactobacillus acidophilus – Initiates the colonization of good bacteria and helps control PH levels primarily in the colon. Bifidobacterium bifidum – Helps maintain intestinal flora. Bifidobacterium lactis – Supports the immune system. Bifidobacterium infantis – The main bacteria found in breastfed infants. Bifidobacterium longum – Helps metabolize a wider range of carbohydrates. The current definition, adopted by the World Health Organization (part of the United Nations’ Food and Agriculture Organization), defines probiotics as “live microorganisms which when administered in adequate amount confer a health benefit on the host”. In simpler terms probiotics are the friendly bacteria that are needed to help maintain a healthy intestinal tract. Nutrition absorption. Nutrients in foods and nutritional supplements are absorbed in the digestive tract. Probiotics help maintain a healthy digestive tract so they also help maximize the body’s ability to absorb nutrition from the healthy things they eat. Immune System. Kids immune systems are being constantly challenged due to their exposure to elements in crowded places such as school. A large percentage of the immune system resides in the digestive tract. Using probiotics to help maintain a healthy digestive tract in turn helps maintain a healthy immune system. Antibiotic treatments. Kids are often prescribed antibiotics by their doctors to treat a variety of ailments. Antibiotics also cause a die-off of the healthy bacteria in the intestinal tract. This can cause side effects such as diarrhea. Taking a probiotic supplement can help replenish the good bacteria in your system.